El Gato (Spanish for "The Cat") is the former mascot for Spanish-language independent television station WAPA-TV Channel 4 in San Juan, Puerto Rico. Starting in the fall of 1970, El Gato was seen in the mainland United States, when WAPA-TV's owner at the time (Screen Gems Broadcasting) bought Spanish/English hybrid independent station WNJU-TV 47 in New York City. The station adopted the same logo as WAPA-TV and imported El Gato to serve as their mascot, as well. Throughout the 1970s and 1980s, WAPA-TV's slogan was "Por el cuatro como el gato" (colloquially "on four (legs) like the cat"), which rhymes in its original Spanish translation. 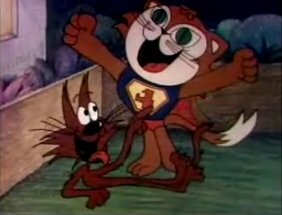 Similarly, another station promo used the phrase, "Hasta el gato, te-ve el cuatro" and the cat itself was alternately known as "el Gato de Cuatro". Like other mascots, El Gato was seen in different situations in different on-air promos. Besides playing the bongos, he would also play the drums or go surfing and was seen in one station ID as a matador. Another promo had him interacting with a cat seen in a Telemundo ad. El Gato would also sometimes be accompanied by his wife and children (one boy and one girl), where they appeared flying in a helicopter shaped like the channel's "4" logo and celebrated the holidays while playing musical instruments. El Gato's last appearance on WNJU-TV 47 was in 1987, when the station was sold to Telemundo, though he stuck around at his home station, WAPA-TV, until retiring in 2007.